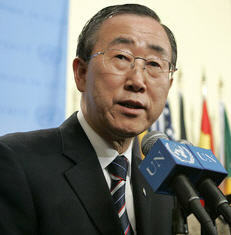 Mr. Ban's appeal, in his latest report to the Security Council, was prepared before two days of clashes in Kinshasa, the capital, between Government forces and the security detail of opposition leaser and former Vice-President Jean-Pierre Bemba, but it gained added weight from the violence which killed nearly 100 people and wounded 111 others, mostly soldiers, before subsiding. UN peacekeepers are still patrolling the city. "I strongly urge the political leaders in the Democratic Republic of the Congo to respect the principles of transparency, inclusiveness and tolerance of dissent," Mr. Ban writes in the report, calling for an extension till 31 December, of the UN Mission in the DRC, known by its French acronym MONUC, with a military and police strength of nearly 18,000. "At the same time, opposition parties should adhere to those same democratic norms, voicing their views responsibly and without resort to violence. Failure to adhere to these democratic principles would seriously undermine the credibility and ultimate legitimacy of the country's political leaders and institutions," he says. The recent clashes were the deadliest in Kinshasa since President Joseph Kabila beat Mr. Bemba in last year's elections, which were the DRC's first in over four decades, the largest and most complex the UN has ever helped organize, and the culmination of a transition from a six-year civil war that cost 4 million lives in fighting and attendant hunger and disease, widely considered the most lethal conflict in the world since World War II. Mr. Ban highlights the significance of the vote as an "historic turning point," but stresses the dangers posed by armed groups in the East of the vast country will remain a core element of the MONUC mandate. "The Government should urgently develop a coherent plan for achieving security in the East, including through the completion of disarmament, demobilization and reintegration, which should be accompanied by efforts to promote national reconciliation, recovery and development in the region," he writes. He underscores the overall need for progress in security sector reform as "key to the restoration and consolidation of peace" in the DRC and to the exit strategy for MONUC, which depends on the achievement of benchmarks in key areas, including in the political sphere, over which Mr. Ban voices concern. "I am concerned at the alleged widespread electoral corruption believed to have influenced the results in several gubernatorial contests," he notes. "Furthermore, the narrowing of the political space for an effective political opposition, including the exclusion of opposition members from the Bureau of the National Assembly, as well as the incitement to violence by some members of opposition parties, represent troubling tendencies that, if not reversed, threaten the nascent democracy of the Democratic Republic of the Congo," he says. The Security Council was today briefed on recent events in Kinshasa, where the violence has stopped but the situation remains tense. "MONUC and the Council are following the matter closely," said Ambassador Dumisani S. Kumalo of South Africa, which holds the rotating presidency this month. In the city MONUC supplied food, water and medicine to some 1,300 people in areas close to fighting and evacuated nearly 1,100 including 16 wounded, among them the Nigerian ambassador, who was wounded in the legs. Seventeen unexploded shells and rockets are currently being neutralized.